Oozing charm exhibiting weathered rugged looks, Oakland’s innovative plastic shed 7 x 7 preserves outdoor storage through an imperishable robust design meanwhile embracing easy-to clean convenience circumvents ongoing maintenance issues susceptible to their wooden counterparts. Investigating the various weather-resistant sheds that bypass arduous roof replacements and recurring varnishing duties not forgetting the predicament of rot, Oakland’s 7½ x 7 ft shed bypasses associated concerns. We’re thrilled with the low maintenance benefits a resin composition delivers. A quick hose down brings back assembly day’s pristine condition in no time, a job I find quite enjoyable these days. Sure beats the headaches and frustrations associated with preserving rotting wood. 7.5 x 7 feet equates to medium size within the storage shed world. Oakland’s display accentuates divine appearances to any garden setting meantime protecting storage through the durability of polypropylene resin. Heavy snowfall, sweltering heat and driving rain are priority concerns however Oakland’s composition is specifically designed & constructed to survive. This 7 footer represents the smallest facility within the Oakland group. The middling 9 ft expanse and the spacious 11 ft depth of the largest model complete the range. Oaklands comprise identical 7½ ft width & looks across their twin-door fronts, merely their lengths vary. Keter’s DUOTECH™ page describes Oakland’s advantages & customizable features. It all becomes apparent why this unique manufacture is expanding across storehouse designs accomplishing flourishing sales aided by respectable feedback. Shed Ranges: presents Oakland’s competing low-maintenance garden shed designs. This mid-size storage amenity excels in serving a whole range of storage solutions. Accommodating long handled tools & extendable ladders within the lofty internals further to storing gardening equipment, plant & lawn supplies, hand & power tools, patio seating & accessories, barbecue gear & grilling utensils including harbouring toys & parking bikes are common usages meanwhile storing weighty lawnmowers presents no issues on account of the purposely strengthened floor. Maybe intentions relate to a super deluxe potting shed or a mighty fine mobility scooter garage, this space accommodates with wide-ranging access for use. Looking for something out of the ordinary? DUOTECH™ design represents the first paintable resin shed manufacture thereby destined to provide an admirable attraction to complement any home garden settings. Oaklands look stunning either left displaying their silvery rustic guise or customised with a personal splash of colour. Oakland’s resin walls are delivered pre-cut ready for assembly, they simply slot together through their tongue and groove conformation delivering convenience whilst assuring rigidity by securing around a steel frame. The walls constitute two sheets of resin, joined together by an internal corrugated structure, best described as ribbed reinforced providing stability to their double skin. A gorgeous silvery-grey exhibit complements the rustic weathered feel embossed by the texture of wood grain running through the surface meanwhile armoured through the backing of polypropylene delivers all-season durability. Surviving resin’s inherent problem in relation to sunburn attack delivering fractures to the skin and colours diminishing through sun-ray pressures is overcome by adding UV protection to the composite thereby delivering a shield of defence to the make-up. Imperishable & impermeable to rainwater describes the advantages of polypropylene. The manufacture withstands the onset of decay leading to the absence of the composition succumbing to weather deterioration meanwhile retaining the convenience of an easy-to-clean surface regards the virtually maintenance-free benefits this type of manufacture beholds. A light spray-hose down pretty much sums-up Oaklands cleaning program. Whenever dirt becomes deep-seated, we usually mix light detergent with warm water and scrub the marks away with a soft brush. White vinegar mixed within the water also works wonders meanwhile the majority tend to take the easy route and deliver a yearly once-over pressure-wash, job’s done in minutes. Consider customising the Oakland! Provide a statement of colour to your garden location by adding a splash of paint to accentuate the accents within your patio or backyard surroundings. DUOTECH™ represents Oaklands blueprint design, delivering a uniquely paintable resin shed range. Manufactured with Keter’s secretive Resin Talc Compound (RTC) caters for the walls to be decorated in your colour choice whilst still maintaining their wooden appearance enhancing through the rustic surface below. Keter suggest a water based acrylic paint, either in full or semi gloss, satin or a lighter shade finish in your chosen shade. It should be noted, the paint will probably fade over time when exposed to the weather elements thereby requiring additional future re-coats however the only preparation prior to re-painting regards a wash-down & dry to clean the surface. A steel frame supports the resin sheets making up the roof’s construction meanwhile steel beams bolster reinforcements resulting in a roof capable of supporting significant snow loads, up to 100 kg/sqm. A steep incline projects towards the apex peak providing a sufficient gradient to carry through efficient rainwater drainage absent from puddling meanwhile the ends of the roof panels adequately overlap the facade preventing rainfall leaking in where the walls adjoin. Impressive 3D slate-effect styling classically crowns Oaklands off whilst the durable & weatherproof polypropylene manufacture provides long term decay-resistance against damp conditions, rainfall and heavy snowfall without being susceptible to future deterioration. Unlike roofing felt, Oaklands survive weather-stresses thereby escape roof replacement projects a few years down the line. Oakland floors provide the durability factor. Arriving in sheet form, an amalgamation of resin & strengtheners develop the floor manufacture into a deep thickset base providing long-term support for demanding pressures, able to survive weighty storage stored upon and challenging physical compression’s endured by wheeling in hefty gardening machinery. The floor sheets clip into place making up the base area whilst interlocking with the walls thereby enclosing the shed to maintain a clean & dry internal environment by preventing debris, rain and pests gaining entry at the base of the walls. The long lasting hard-wearing make-up will only suffice demanding stresses if the floor is laid upon solid flat foundations, an essential requirement for all plastic sheds, as explained in the assembly section. Best practice after construction regards anchoring Oakland’s down onto the foundations to increase wind resistance and stability levels. Presented within the floor, anchor indentations determine the screw placements for securing the shed down onto the ground. I wouldn’t choose a shed without a built-in floor nowadays, storage is kept so clean due to the elimination of outside draughts sweeping debris through at the base of the walls, the envy of floor-less metal sheds requiring either a thick line of sealant to blockade and maybe fitting a wooden floor, defeating the maintenance-free objective. 7.5 x 7 ft equates to roughly 50 square feet, an adequate amount of space to accommodate a wide variety of storage. Oaklands allow for customisation, specially designed D-Clip™ Wall Anchors make it possible to fit shelves, organisers and peg-board strips etc however another popular solution implemented by many including ourselves regards installing free standing shelves and large stacker boxes exploiting Oaklands generous internal height. You ain’t gonna be banging your head inside either, there’s in excess of 2 metres internal height attributed through the steep apex style roof providing an airy atmosphere, comfortable for an adult to move around with ease without having any associations of claustrophobic or bent-over feelings. A skylight made from translucent polycarbonate embeds within the apex ridge. Accompanied by the Victorian style window they illumine daylight to the interior meanwhile contrary to every advert I have read with regards to ventilation panels, Oaklands do not incorporate them. Keter have been in touch to verify & recommend opening the doors to attain a draft of fresh air. Whether you’re wishing to store gardening equipment, lawn mowers, long handled tools & ladders, patio seating & accessories, barbecue gear, park bikes, harbour kids toys or wheel-in such equipment like mobility scooters & drive-on mowers, Oakland’s are specifically designed with dimensions to store lengthy implements and built to survive strenuous storage pressures. The silvery glistening facade blends effortlessly with the beefy charcoal doors, many admirers appreciate the stylish appearance Oaklands possess, expressing a bravo presence attributed by their burly doors stance. Manufactured with weatherproof & rot-resistant polypropylene moulds the doors into a dual-wall skin representing a stylish wood panel semblance displayed in charcoal shade. The wide robust double doors span towards the width of the shed providing oceans of access easing the process of carting in weighty storage and wheeling in heavy equipment, aided by the floor’s sloped threshold. The doors include quality finishing touches. A stainless steel locking system enhances strength & security, operated by the padlock designed handle & clasp that secures both doors simultaneously. The left door can be kept closed by sliding internal deadbolts, a useful feature for windy days preventing swinging door damages whilst quality door hardware & hinges ensure a robust closure when shutting both doors. 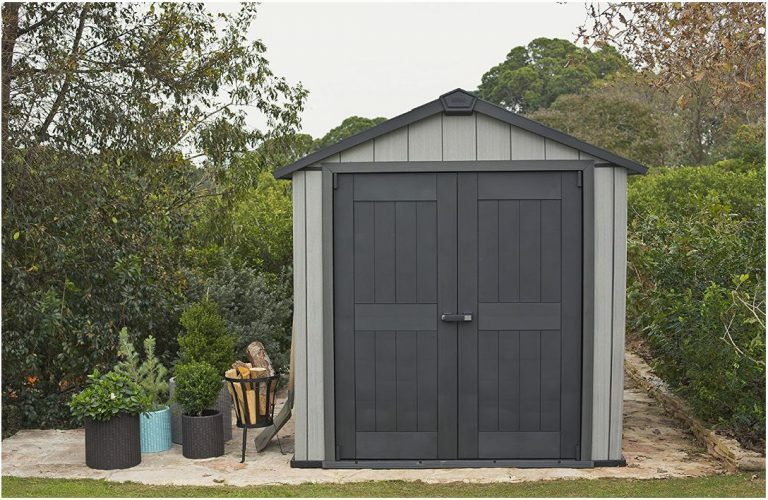 Oakland’s are presently the only low-maintenance resin shed that caters for painting meanwhile revitalising their rustic charm once subject to the dirt appearing is generally virtue of a swift shower down with a garden hose. For anything more ingrained however, white vinegar or washing up liquid squirted into a bucket of warm water and mildly scrubbed helps replenish a resin manufacture back to assembly day’s spotless shine. Refrain from using anything too abrasive, like scrub-buds to prevent scratching the surface. The other popular option regards the pressure-wash method. A future absent from roof replacements, no more rotting quandaries nor varnish, stain or paint tins to re-stock for future conservation unless you opt to customise the shed in your chosen colour. Further down the line a painted shed will probably require re-coating due to colour-fade however there won’t be any decay issues to deal with. Assembling Oaklands becomes fairly straightforward due to their tongue and groove panels easing alignment, wrapping around the steel framework and securing with screws. The instructions require assemblers to work through the orderly steps implementing the shown procedure. Oaklands require two people to build, room is required all round the shed for fixing the roof whilst a step ladder is a necessity. Prior to our resin shed assembly we took a top tip on board, placing all the parts in order of the sequence set out in the instructions. This really does speed up constructing. Unfortunately most sales sites only concentrate on selling and fail to explain the importance of preparing the correct foundations to station a resin shed on. This really is a one step process that eliminates future problems and aids assembly significantly. Foundations should be solid & level. Wood decking, concrete or materials suchlike paving, asphalt and tarmac with the emphasis of being laid level, raised slightly above the ground deliver a flawless base for a resin shed construction whilst preventing the shed standing in a flood. If the base fails to be level, aligning the panels becomes frustrating, this becomes exaggerated when constructing the roof panels. Level footings ease the assembly process dramatically. The roof weight provides equilibrium on all shed sides if the foundations are level, avoiding leaning pressures . A level base delivers plumb vertical door architraves aiding the doors correct swing when opening and closing, simplifying their assembly. 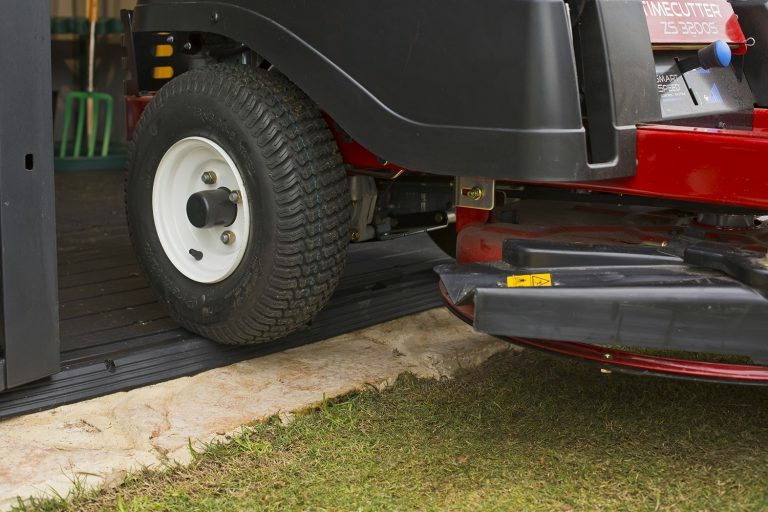 A solid level flat surface is required for the floor to survive the stresses endured by weighty equipment like the pressures rolling in a sit-on-mower entails. Intensifying stability and wind resistance levels is accomplished by solidly anchoring Oakland’s down. The only niggles seem to regard inserting the doors into the architraves and lining plumb for a few, the reason it’s imperative to start from level footings. 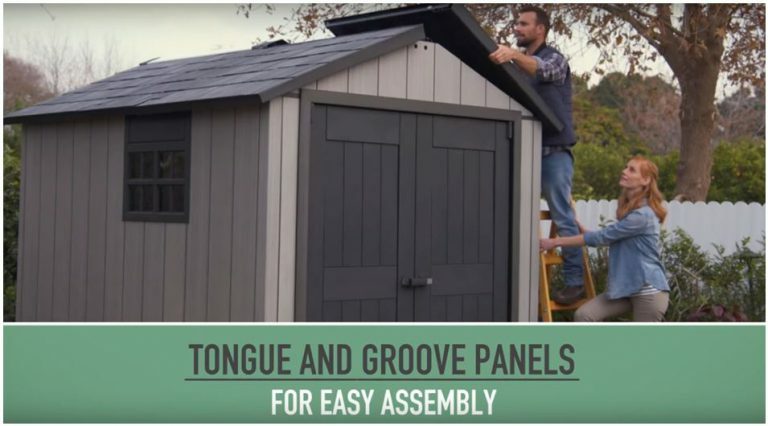 Although these sheds are designed to assemble with household tools, many remark on the vast amount of screws it takes to build however an automatic screwdriver set to reduced torque speeds things up considerably. Overall, a lot of happy chappies who’ve constructed theirs – Wonderful reviews. Competition is presently becoming quite intense regarding the weatherproof variety of garden sheds. Many people are determined to sidestep yearly maintenance. Oakland’s innovation represents the new age of Garden Shed designs. I would be hard pressed to say the Oakland range can be beaten because there are plenty of comparable weatherproof varieties represented here on this website. A spectacular shed through and through with a grand facade exhibiting quite an awe-inspiring presentation. Improved robustness, strength and resistance to weather-rot meanwhile not straying away from convenience is virtue of the easy-to-clean manufacture, to which a hose down rapidly accomplishes. 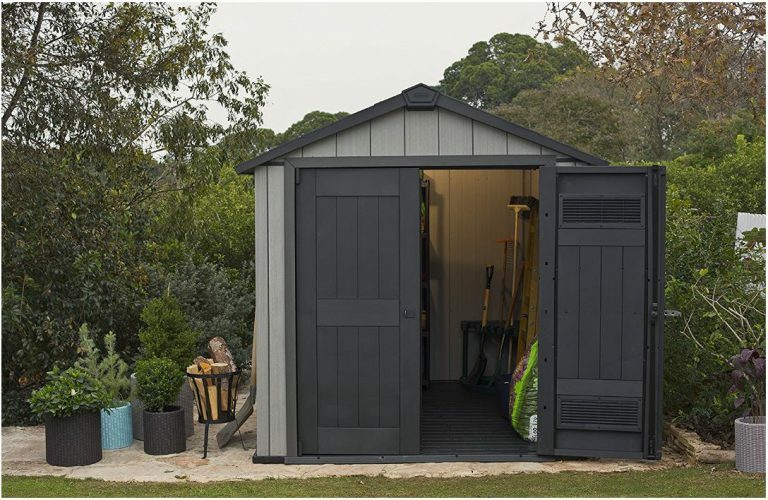 Superb feedback confirms the built-in preservation qualities, easy access makes storing a breeze whilst quality finishing touches transfer this facility into the advanced league of Garden Sheds. A higher price, yes but like anything, budget dictates. Hope Oakland’s weatherproof 7 ft storehouse inspires decision making. Share your Oakland shed queries, always happy help where I can. Please share Oaklands 7 footer. Thank you! Great detail on the different features and benefits of this range, never heard of the range before. but definitely feel more confident in them through reading your review. Hey John, thanks for taking an inspection of Oakland’s 7 ft square shed. 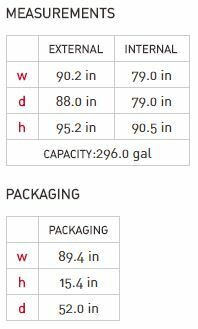 Oakland sheds are fairly new to the market, currently there are 4 models spanning from this 7 ft size up to 11 feet in length. They are manufactured out the Duotech material which is an innovative polypropylene-based resin containing UV protection and a resin talc formula that adheres to acrylic emulsion, producing a unique paintable resin shed. Further to the additives, groundbreaking molding methods create very realistic weathered-wood patterns to the touch across the fascia panels, enhanced by a silvery shade for the purpose of exhibiting a rustic appearance that compliments garden backgrounds. The pure benefit of Duotech’s make-up is that it’s not susceptible to rot and depreciation caused by the weather no matter what the climate’s like, from lumps of heavy snowfall, driving rain, sunburn scorch or situated long-term in damp environments – The manufacture remains unaffected therefore doesn’t entail continual coats of preservative wood-stain on an annual basis nor roof replacements. Freshening up appearances is super-swift too. In the main, we hose our shed down with the shower connected clicked into the hosepipe, there’s nothing to it. Great Review Simon. 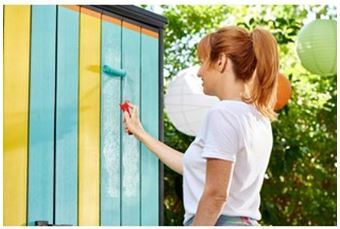 Your reviews can make anyone rush to buy the product 🙂 I loved the idea of painting the shed of your own favourite colours you want to see in your backyard. I liked it much because it contains double door which will make easy to wheeling inside heavy and space taking items. Great Job!! 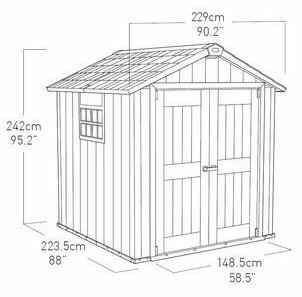 Hi Sarah, thanks for your thorough inspection regarding Duotech’s Oakland 7 ft square shed. I think every shed sells it’s self really. I would never try and convince anyone to purchase a particular storehouse, the idea of this website is to provide visitors with plenty of ideas along with a thorough review of each shed that includes the relevant enhancing features, internal & external measurements to measure storage & location against, a selection of photos so they can visualise what it would look like in their surroundings and a manufacturers video which demonstrates the features & looks in a real life setting. Duotech is the first ‘resin based outdoor shed manufacture’ that has been purposely designed for painting. Upon first glance I presumed oil-based paint would provide the coverage but surprisingly water-based acrylic paint’s advised & rolls on a treat. Using emulsion removes all frustrating headaches in my book, painting this way is quite a leisurely experience meanwhile overtime when colours start to fade, you’ll have no rotting issues to sort prior the administering another coat. A quick wash & dry and you’re rolling. You are right Sarah, painting provides the opportunity to make a unique statement in your colour choice to brighten-up the backyard. My only issue here is, I’m an admirer of Oakland’s rustic mane-cave looks, there’s a dilemma to overcome – ha! These are some great sheds. I think you did a good job on informing us about these maintenance free sheds, and how easy they are to assemble. I’m myself was thinking about getting a shed for my backyard, and these really caught my eye. I like the different sizes, and that they’re water proof. 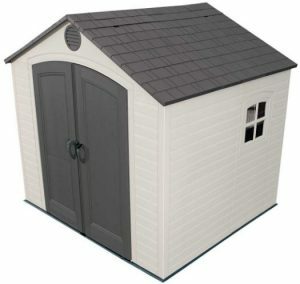 Overall Impressive reviews on these wonderful sheds thanks for your information. Hey Junior, thanks for stopping by to read about the benefits Oakland’s 7×7 ft shed provides. Weather-resistant to survive all seasons climates is essentially what a polypropylene make-up defends against. Not being susceptible to rot and corrosion escapes future conserving with varnish & wood-stain and sidesteps replacements of rotting panels and disintegrated felted roofs. An expeditious wash soon rejuvenates the new look. For our concerns we usually connect the shower adaptor and hose-spray the shed down which takes minutes on a summer’s evening, others perform an occasional pressure-wash, easygoing maintenance. And you’re right, they’re pretty basic to assemble, construction is simplified owing to their tongue and groove formation, a case of aligning and screwing into position. Just make sure you prepare solid level ground for stationing the shed, this is a pivotal part of their construction that also eases assembly. This make-up also caters for painting in acrylic emulsion, the paint usually advertised as bathroom and kitchen paint owing to it’s toughened mix sustaining heavy duty wipe overs without leaving scuff marks. I like the rustic appearance displayed the way it is however my wife would opt to paint and brighten up the garden. Each to their own however this uniquely paintable resin design certainly sparks debate. I noticed in your article on that you can assemble your own shed! 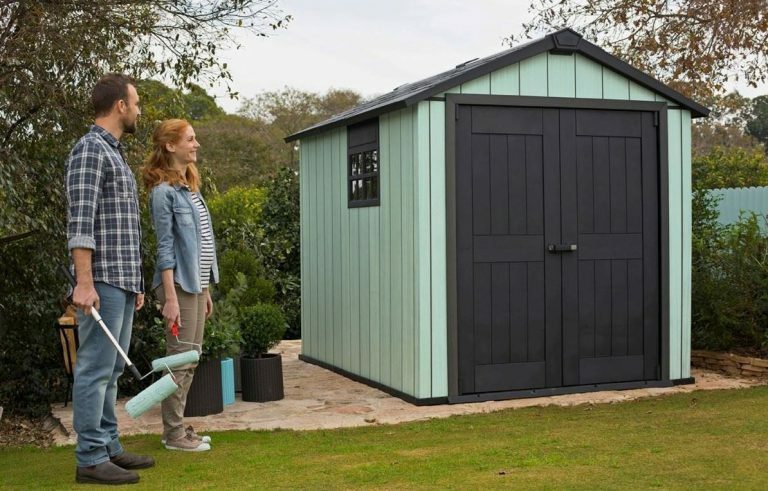 Now that is novel and pretty cool, just in case you have to move house, you don’t have to leave your shed behind – as we know, we kinda get attached to things like sheds for the hours we may spend in them overall. 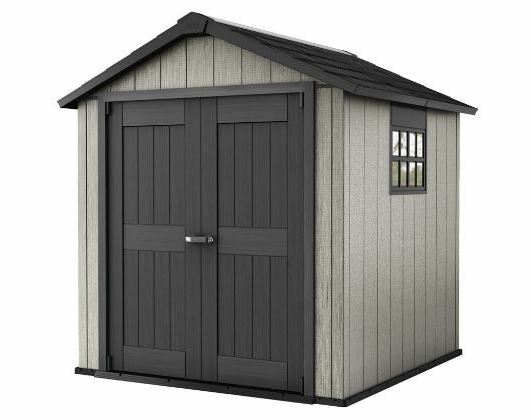 I had a look at the prices of some of you weather resistant sheds, and given they are customizable sheds, weather resistant and very easy to keep prestine, it is a very worth while investment to have a shed that will last a life time! Not to mention the locking system will you peace of mind for added security for you gardening items like lawn mowers, which, can be expensive sometimes. Thank you for this amazing review on Oaklands plastic sheds and I am very impressed. Now, it is time to convince the misses that we can’t live without one 🙂 wish me luck. Hi Philip, good luck convincing your misses, I’m sure she’ll agree but if she’s like my wife, then you’re gonna be painting this Oakland to display a resplendent finish that brightens up your home-yard. Personally I like the slivered rustic charm Oaklands exhibit but my wife would opt to make a statement. Expect some work – ha! 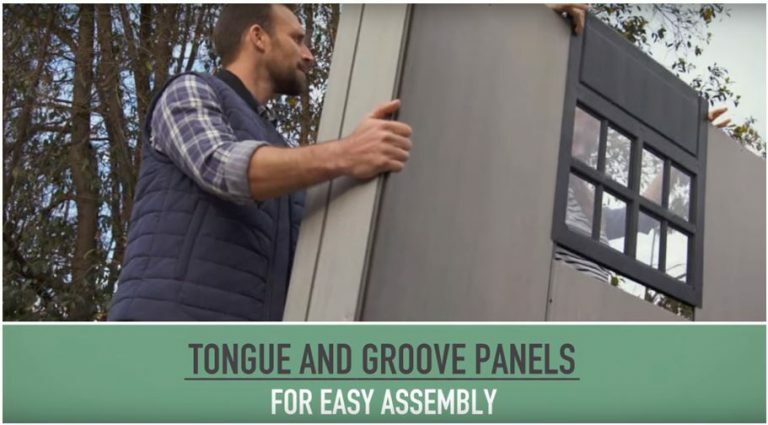 All resin sheds are self assembly however Oaklands have a tongue & groove panel configuration that simplifies aligning the panels, apart from loads of screws they are pretty straightforward to construct. Their only necessity concerns positioning on a solid platform that’s perfectly level to accomplish the construction of a rigidly grounded shed that stands perpendicular. Once the base preparations are in situ, you’re rolling. We opted for this type of composition simply to depart from conserving wood-stain on a annual basis notwithstanding escaping the disintegration problems felted roofs succumb to. Nowadays we occasionally shower the shed down with the hosepipe, job’s done is 5 minutes. You are able to dismantle, great idea but I have never done this. I wonder whether the screws fixing positions may diminish, I’m really not sure to be honest. Oakland sheds are pretty secure once they’re locked up owing to their stainless steel locking mechanism however if your area suffers high crime rate and you’re going to be storing expensive gardening equipment, Asgard’s weatherproof steel sheds maybe worth inspecting for total piece of mind. Although we live in an area where crime rate is pretty high, our back garden is fairly secluded therefore this style of resin suits us fine. The Oakland 757 looks like it would be a great addition to my yard. The wife has put her foot down and now I must find a place to store my dirt bikes, or they have to go. And you know I am not getting ride of any one of them(3). In your review i see that they can be painted. That is a good thing because i want it to match my home. Does the paint adhere to the surface strongly? Or would I need to paint it often as a maintenance project? Thanks for taking a read of Oakland’s 757 shed. Sounds like you’ve had your orders Brendon – ha! Oakland sheds have real man-cave appearances meanwhile double door access including a ramp threshold at the entrance aids to wheel dirt bikes inside, so this style may be right up your street. Like any shed, Oakland’s caveat regards locating on solid level footings to assure full support for 3 bikes further to applying rigid anchorage and you’re good to go. Oakland’s are presently available in 3 sizes, their 7.5 ft width and height are identical throughout the range meanwhile this model represents the smallest, the 9 footer middles the range whereas the largest length stretches 11 feet, worth checking out if you require larger dimensions for fitting 3 bikes inside. Duotech recommend Water-based Acrylic paint, the sort of paint used for decorating bathrooms and kitchens due to comprising hardening elements so they can be washed and wiped. I must admit we use Acrylic paint decorating every room nowadays as marks easily wipe away. Local DIY stores have huge ranges in an abundance of colours, they usually mix it while you wait. Acrylic will adhere just fine as Duotech have purposely designed the resin talc formula making up the composition to bond to this type of paint but you will probably find the paint discolours over time due to weather assault. Just a quick wash and dry prior to an additional coat is all that’s required owing to the make-up’s immunity from rot. I too have been searching for the D Clip Wall Anchors to point visitors towards but this Duotech range is very new to the market. I would ask the supplier to where you are thinking of purchasing or have purchased from. They should be able to help as these aid to customise Oakland sheds for hanging items and installing shelves. Failing that I have found Keter’s Phone number for the UK. This is their telephone number: +44-(0)121-506-0008 Monday to Friday 8am – 5pm. I’d appreciate you letting me know how you get on phoning Keter regarding where to purchase their D-Clip Wall Anchors for their Duotech Oakland range of sheds. Thanks so much, appreciate your time. Thanks for getting back to me regarding Keter’s D-Clip Wall Anchors. Why these large companies don’t offer to phone you back is rather frustrating, this would only increase their feedback score regarding customer satisfaction. Every sales review regarding their Durotech Range on the Keter website inclusive of Oakland’s various shed sizes mentions these D-Clip Wall Anchors with links to the Doutech page where they fully demonstrated plus they have a dedicated section explaining how the D-Clip Wall Anchors work on the Keter website. I new these D-Clip Wall Anchors along with their Duotech range are new however a year seems rather a long time when they are publicising so openly. This is a great review. Makes me want to run out and buy one for sure! It is a little lengthy (for me, today – perhaps if I was looking for a shed right this minute I would luxuriate in your long description) but you break it up nicely with content that is funny and unique (“you ain’t gonna be bangin’ your head”). I think the emphasis on the wood-like surface without the care associated with real wood is smart. Good job! Thanks for dropping by and reading about Keter’s Oakland 757 version of a quality plastic shed. 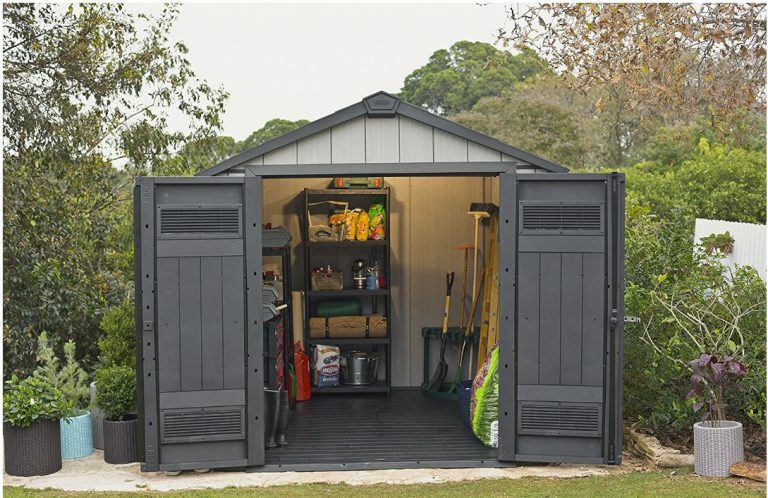 I’m glad you enjoyed reading the review, these are great sheds if you are searching for a virtually maintenance-free future as they only require a wash down when the dirt appears. 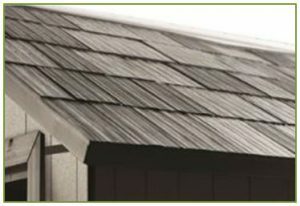 Yeah, this composite mix is unique to Keter, allowing you to fully customize the shed with paint to blend in with your outdoor setting. Wood yes however mixed within regards the durability powers of polypropylene resin that withstands deterioration when the shed suffers weather attack and damp conditions. Great product these plastic resin sheds sounds to be, really caught my eye you can even paint these sheds to make them even more appealing to the eye. 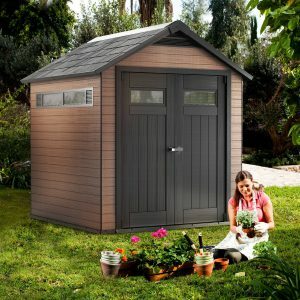 If you do not pain your shed, is there any maintenance you must perform to protect your shed, if so how often do you have to protect your shed and how would I do this? Thanks for stopping by and reading about this Oakland shed. If you do not paint the shed then the only small amount of maintenance regards a wash down to keep it looking pristine, we just spray ours down, now and again when ingrained dirt starts to build we remove with light detergent mixed with warm water and rub off with a soft brush. Oaklands are virtually maintenance free. If you decide to paint it however, then overtime the colour will probably fade due to being exposed to the weather conditions. Just give it another coat of paint to re-freshen the appearance. There won’t be any decay to deal with as resin resists rust and rot. Everyone is different, I like the appearance of the silver weathered facade yet others prefer to add a statement of colour to enhance their surroundings. It’s all down to personal preference. I have just looked at your article on plastic sheds and I must say its impressive. I like the way we can pick and choose the size and also the fact that we can paint these sheds whatever colour we decide. I like the fact that these units are pretty much maintenance free and also weatherproof as well. 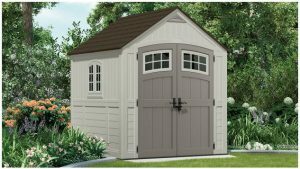 They are so compact and also they are so secure, I have no doubt that these sheds will enhance the appearance of any home, regardless if we decide to locate these in the back or front of our homes. Thanks for calling in and reading about this New-Age garden shed. Yes, this is the 7.5 x 7 ft Oakland, the range consists of the same widths across the doors, only the lengths vary. Alternatively there’s the 9 ft depth or the largest 11 ft depth. Oaklands are the first resin manufacture designed for painting giving anyone the opportunity to add a splash of colour and make a statement to brighten up any surroundings. The low maintenance values are the big draw, they’re so easy to keep clean. We generally just hose ours down and that’s the job done. There’s no rust or rot to deal with and as you say, resin is waterproof, therefore storage is protected. Oaklands have a stainless steel closing mechanism therefore more quality than their ever popular Factor range however Factors are more competitive as they don’t harbour all the quality finishes Oaklands contain. Once the doors are closed, a padlock secures the shed. Yeah, I agree with you, they’re certainly a good looker, designed to complement any garden with style. Thanks for taking your time to read about this new-age Oakland shed. 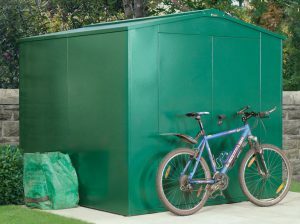 Yeah, it’s a good looking low maintenance garden shed designed to complement any surroundings. Although fairly new to the market they are receiving exceptional feedback plus there’s a lot of new styles in various sizes based on this Oakland manufacture just been released for summer. This speaks volumes for this design potential. 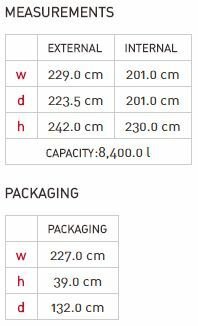 Wow, you are looking for a large size, 12 x 24 ft are huge dimensions but as you say, yours is for a workshop and you have chosen metal. Good luck with your build and many happy future years working away in your workshop. Gorgeous shed. Never thought I’d say that. I was wondering if this would be easily cleaned out with a hose? It looks like an option for a good size chicken coop if it could be modified a little for more airflow and perhaps a small door for the chickens. Probably crazy, but do you think it’s possible? I bet I’ve made your day saying Gorgeous shed – ha! Resin sheds like this are designed to be washed down with a hose or a bucket of hot soapy water as they are impervious to water and their low maintenance advantages results in no deterioration to the roof and facade. I shouldn’t see why it cannot be used as a chicken coop as there is ventilation provided within the shed so you don’t have that sweaty plastic atmosphere inside any more so that’s a huge positive. 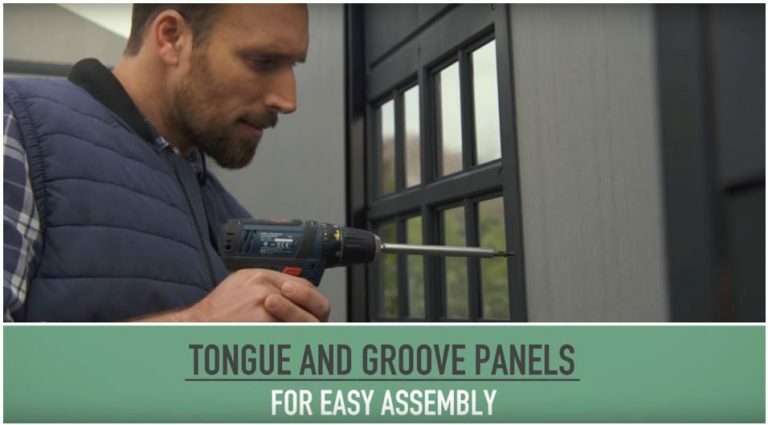 As far as cutting into the doors or walls to insert another door, I’m not sure as you would definitely ruin the warranty and I think you would have a problem attaching the door to the resin surround. Plastic/resin sheds are a lot cleaner than wooden sheds which allow you to wash them out without any deterioration problems yet a wooden shed would allow you to fit a door easier than a plastic one. Bit of a catch 22 here I’m afraid. I really like the look of the oakland shed. The design is really nice and the fact that it will hold a snow load is important to me as I live in an area where we get alot of snow at times. 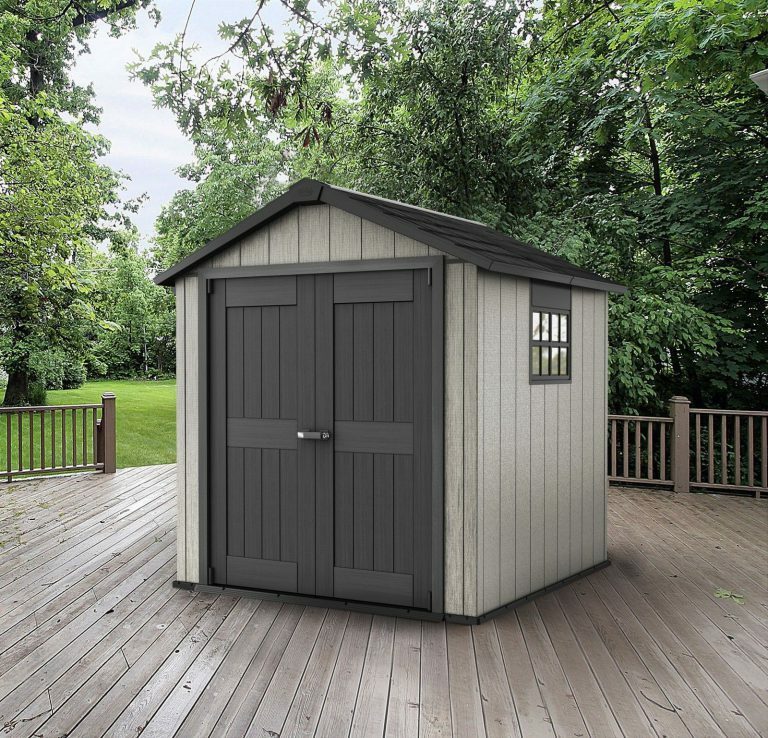 This really is a nice looking shed and could be placed anywhere in your yard. I like that the surface is repaintable so I could repaint it to match any area. Thanks for reading and messaging. The Oakland range are such an attractive design, newish to the market yet are becoming ever so popular due to their stylish looks and virtually maintenance free benefits. 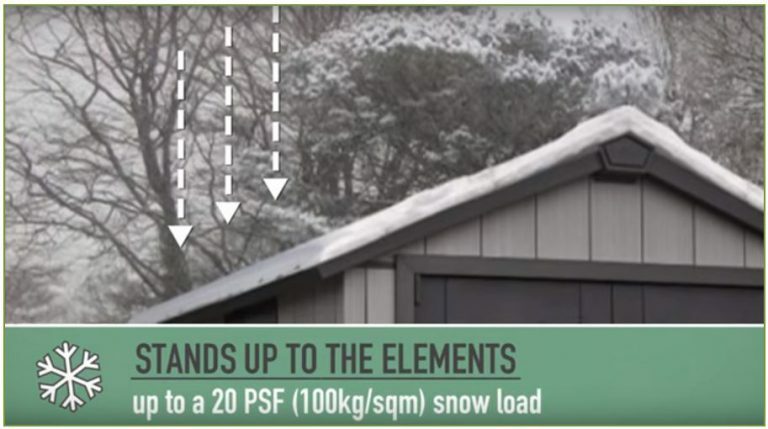 Yeah, Keter have purposely designed this shed to support heavy snow loads, imperative for areas such as where you live. A stronger design altogether compared to their Factor range. All the men seem to prefer the natural mancave looks whilst the women prefer adding a splash of colour to make a statement in their garden. It’s so funny listening to my friends compare these options. 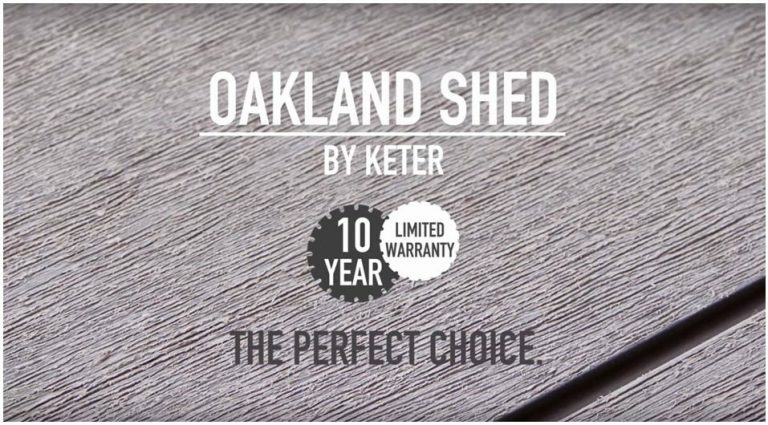 I actually really like the Keter Oakland Shed. Looks stylish, is the right size and looks really durable. Plus, seems you could also move it a lot easier than you could a metal or wood structure I would think. I clicked on the reviews, and they were all really pretty good with just a few assembly “nightmares”, but I think that comes with anything. 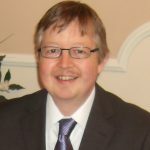 Thanks for reading and taking your time to comment. Apparently you can dismantle and move the plastic / resin variety of sheds but I have never done this. The only negative view on my behalf regarding this issue is that the screws would become diminished to some extent and it may not reassemble as sturdy as it last stood. I would be interested knowing whether anyone has done this. The #1 priority is assembling reisin sheds on solid level foundations as everything lines up correctly and the floor serves as heavy duty. Those who conform to the manufacturer’s rules regarding a solid level foundation find assembly a breeze. There are a lot of screws which seem daunting to the novice DIYer but unfortunately any sheds require this amount to accomplish a sturdy quality finish.